Whether your operation requires only one type of pallet racking or a complex pick module, this guide will help you sort through the options. Read below to learn the differences and ideal uses of pallet racking types, conveyor systems, and warehouse layout options. 1. 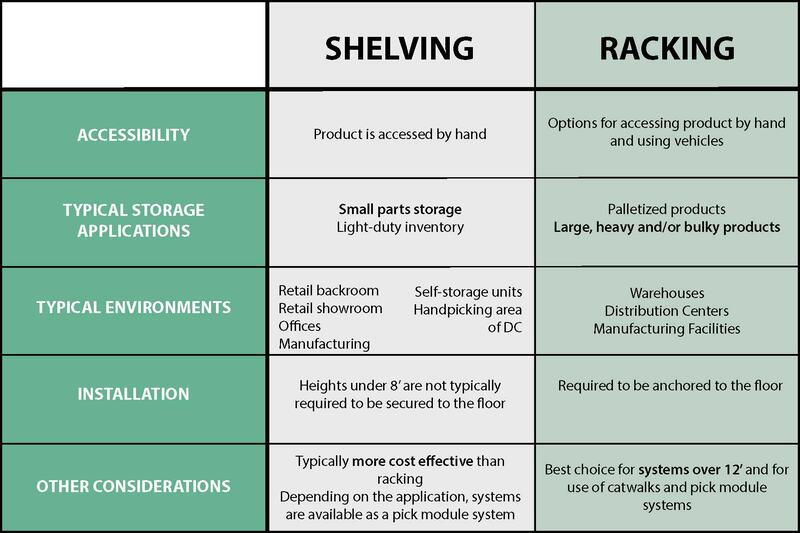 Assess your inventory to determine which type(s) of racking (or shelving) suites it best. To maximize product flow, the type, density and selectivity should align with inventory control and picking practices. In order to maximize the benefits of your warehouse, you must understand the characteristics of all the products that are to be stored. Below is an overview of each type of racking system. To view further details on each, visit our racking pages by clicking on the links below. Need to compare racking vs. shelving? Click here. 2. Determine the configuration of your racking. A pick module is designed to advance the efficiency of product flow by reducing walking/equipment travel time. A pick module can consist of one or multiple levels and can be designed in a number of configurations. 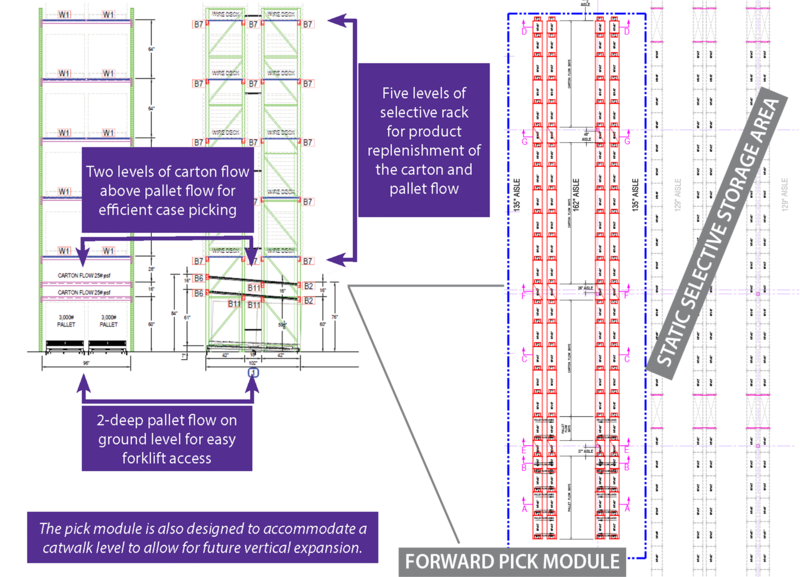 For example, as shown in the illustration below, pallet flow, carton flow, and selective rack are integrated together to expedite the order fulfillment process. 3. Determine if adding conveyors to your pick module will be beneficial to your operation. Adding conveyors to your distribution center can reduce handling costs, increase throughput, and ultimately increase profits. 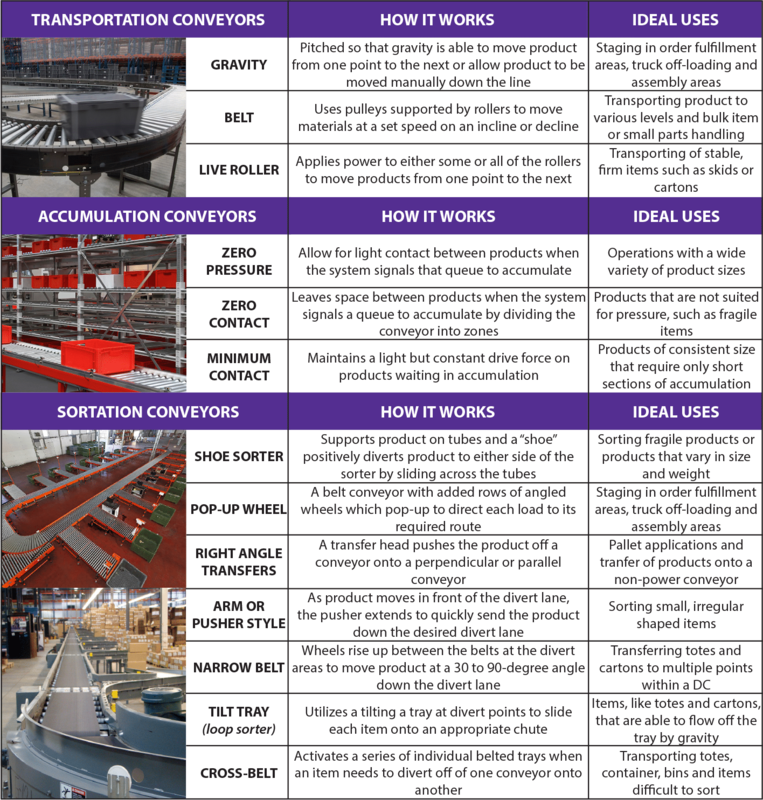 Below is an overview of each type of conveyor system REB offers. For further details on each conveyor system type view over accumulation, transportation and sortation conveyor product pages. 4. Conclude where various operations will take place. Shipping and receiving docks are located next to each other. High cross-docking capability, minimizing product handling. Shipping and receiving docks are located on different sides of building. Provide heightened security due to the separate "in" and "out" areas. Typically provide larger sorting and staging areas for shipping and receiving. Provide isolated monitoring of shipping and receiving areas. Now that you have a better idea of what your ideal material handling system should look like, we'd appreciate the opportunity to help you with the next step in implementing it, whether that be more information or a quote request. Fill in the 'Submit an Inquiry' form to give us a better idea of your needs, and we'll contact you to help with any further questions or requirements you have. REB Storage Systems is considered in the material handling industry as an integrator, meaning we manage your project from conception to completion. First, we present you with professionally engineered storage solutions to advance the efficiency of your facility. Once this is finalized, we make it all come together by obtaining necessary permits, arranging deliveries, providing a professional installation, and conducting a final walk through with your team and, if required, the Village Inspector. For more than 55 years, REB has handled every aspect of racking systems for some of the world's most successful companies. We hope that you will invite us to help you.